December 30, 2006 – GAME OF THE YEAR on GAMETUNNEL! "...Gumboy is a stellar title, with great visuals, quirky sound and an endearing premise. It is a game that is equally unique and innovative as the oft-compared Gish. Gumboy is the kind of game that really shows what independent games are all about, it's a game that every gamer should spend hours getting to know better. Those who do will be rewarded with a unique experience that rolled away with our award for Adventure Game of the Year." November 6, 2006 – GAME OF THE MONTH again! Actually on EDGE 169. "...Czech developer Cinemax has created an at-times dark fairytale world that’s as deeply physical to move through as either of the aforementioned games... (LocoRoco, Gish, Samorost, Wik)." Rating: INTERNET GAME OF THE MONTH. Gumboy is quite possibly the best indie game I've played this year." . 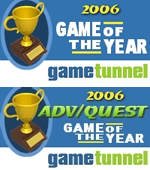 Link to Awards on GAME TUNNEL. Another Gumboy review on Internet. Amazing rating (8.5/10) again:"... The first thing you’ll notice when you play Gumboy is that it’s absolutely gorgeous." . Link to Review on GAMERSMARK. First Gumboy review on Internet. Amazing rating 8.9/10. Jason Young: "... From collecting stars in a Sonic-like fashion to helping Mr. Bean find his lost children, players of all ages will become enthralled with its high level of gameplay, addictive nature, and high amount of replayability- especially if you love playing with balls." . Link to Review on Gaming Target. Good news! First version of Gumboy is done. If you would like to get a friendly update when new things happen on this site, please enter your email address below! No spam. We promise. Sign up for our newsletter and get news, discounts, bonuses or win free games. You can cancel your membership anytime.